Whether you sing Karaoke or come to cheer your friends on stage, join us to support a wonderful local organization serving women in our community! During the “Rocking Women of Ridgefield” event you’ll have the opportunity to sing Karaoke using a professional sound system, with the assistance of trained musicians. You can start your stage debut experience by trying out the complete line of LimeLife by Alcone professional makeup products and tools. Create a totally natural look, a sultry evening look, or go for something really dramatic to light up the stage. It’s up to you how you want to rock your makeup while you have some fun and support a great cause! This line is custom curated to bring the very best professional makeup products and tools to makeup artists in theatre, behind the camera, and for runway work – as well as for women from all walks of life! Enjoy the benefits of using what the pro’s use. Experience the difference and see for yourself what great results you can get by using professional makeup. 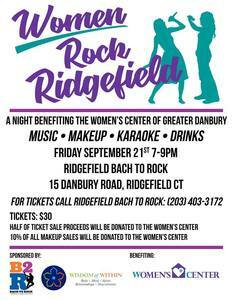 In addition to 50% of the ticket sales raising funds for the WCGD, 10% of LimeLife by Alcone product sales during in person and online party will be personally donated to The Women’s Center of Greater Danbury by Pamela Miles, Independent LimeLife by Alcone Beauty Guide. Refreshments will be served and we're sure to have a lot of fun!